Two refugee facilities located in separate parts of Germany caught fire throughout the course of one day, local media reported. In one case, an arson attack is suspected. 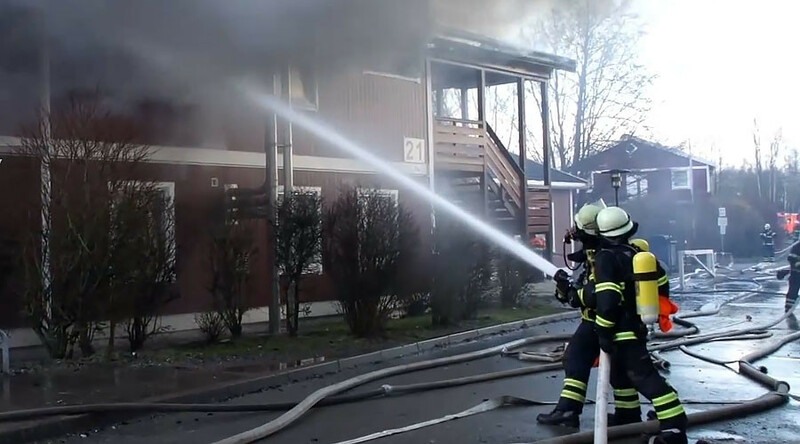 In one incident, a wooden house was allegedly set on fire in Bergedorf, one of the boroughs of Hamburg, according to NDR. Multiple refugees from Afghanistan and Iraq are living in similar houses in the area. Some 50 firefighters quickly extinguished the blaze, but one man was taken to a hospital with inhalation burns. A 31-year-old woman was detained by police even before the fire was brought under control, NDR reported. The woman, said to be residing in the house, is known to police for attempting to commit other arson attacks. Given that the suspect has mental issues, “political background” was ruled out as a motive. In the other case, several containers housing around 120 Gambian refugees in Wernau, a town in southwestern Germany, caught fire on Friday night, local police said in a statement. Emergency services dispatched ten firetrucks and about 70 personnel, as well as five ambulances. No one was injured in that fire, and the incident apparently wasn’t a hate-motivated attack, the police statement said. The cause of the blaze is still unclear, and a forensic unit has begun searching for evidence on the scene. Though these particular incidents have yet to be investigated, arson attacks in Germany often target refugees. In 2016 alone, German police recorded 45 arson attacks on refugee centers across the country, the majority which were carried out by locals living nearby. According to Germany’s criminal police office, there were a total of over 800 attacks of different kinds on refugee shelters in 2015, a four-fold increase from 2014, when there were 199 cases.